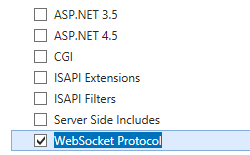 The <webSocket> element specifies the use of the WebSocketModule module with ASP.NET 4.5 to support writing server applications that communicate over the WebSocket Protocol. WebSocket enables you to provide full-duplex communications over a single TCP connection by using a stream of messages rather than a stream of bytes. This makes it easier to connect to data sources asynchronously in cloud deployments. IIS 10.0 The <webSocket> element was not modified in IIS 10.0. 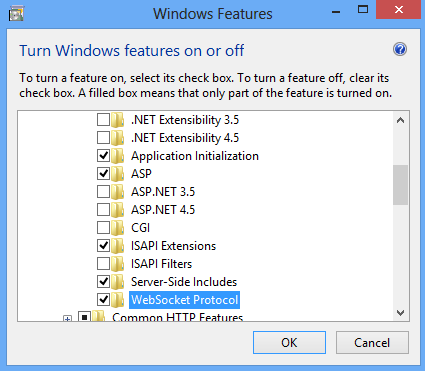 IIS 8.5 The <webSocket> element was not modified in IIS 8.5. IIS 8.0 The <webSocket> element was introduced in IIS 8.0. 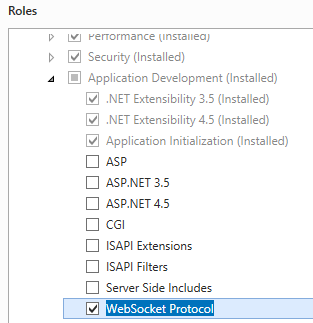 On the Server Roles page, expand Web Server (IIS), expand Web Server, expand Application Development, and then select WebSocket Protocol. Click Next. On the Start screen, move the pointer all the way to the lower left corner, right-click the Start button, and then click Control Panel. - In Control Panel, click Programs and Features, and then click Turn Windows features on or off. Expand Internet Information Services, expand World Wide Web Services, expand Application Development Features, and then select WebSocket Protocol. Developers can use the IWebSocketContext API to create applications that implement bidirectional and fully duplex communications between client and server, sending streams of messages instead of bytes. 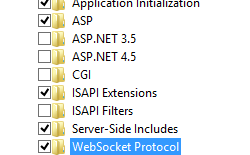 The IWebSocketContext API exposes the necessary API's to read/write WebSocket data. If an incoming request is to be accepted as a WebSocket request and subsequently upgraded, the handler must set the response status as 101. It should initiate an IHttpResponse->Flush, which will trigger the IIS WebSocket module to do the necessary work to send out the 101 response to the client. Once the response is sent, the handler can get a pointer to the IWebSocketContext through the IHttpContext3's GetNamedContext API. For more information, see IWebSocketContext interface. 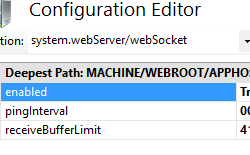 In the Connections pane, select the server name to configure WebSocket for the server, or expand Sites and then select a site to configure WebSocket for the site, or expand a site and then select an application to configure WebSocket for the application. For either a site or an application, select either web.config or applicationHost.config in the From text box. Select system.webServer/webSocket in the Section text box. Set enabled to True to enable webSocket or False to disable webSocket. Set pingInterval and receiveBufferLimit to the desired values. The <webSocket> element is configured at the server, site, or application level. Enables server applications to communicate over the WebSocket protocol. The interval at which a ping is sent over a WebSocket connection. The maximum size of the receive buffer for a WebSocket connection. The default value is 4194304. The following sample displays a <webSocket> element. The following sample code configures <webSocket> for a site. Set-WebConfigurationProperty -pspath 'MACHINE/WEBROOT/APPHOST' -location 'Default Web Site' -filter "system.webServer/webSocket" -name "enabled" -value "True"
Set-WebConfigurationProperty -pspath 'MACHINE/WEBROOT/APPHOST' -location 'Default Web Site' -filter "system.webServer/webSocket" -name "pingInterval" -value "00:00:20"